Slimming World Diary: SW Works Without You Knowing It .. I am on it this week, went to the gym yesterday evening to get my body magic in, tread mill, bike, cross trainer and weights. really felt it last night as well, I always feel better when I feel it. I think that I've actually made a difference then. My son was off school for teacher training day so I got my body magic in today as well. From racing home from the shops with him to dancing to Gangnam Style around the house, now that dance is a workout! To quench my appetite after dancing I made spaghetti cabonara, the easiest one I have ever made. I'm not lying it literally took 15 mins, and tasted amazing, not to mention so filling and syn free. 1. Cook the spaghetti according to packet instructions. Drain and keep warm. 2. Meanwhile place a large deep frying pan sprayed with Fry Light over a medium-high heat. Stir-fry the bacon for 2-3 mins, or until lightly golden. Add the garlic and stir-fry for 30 seconds, then remove from heat. 3. Add the spaghetti, beaten eggs and half the Parmesan, season and toss well (the heat from the spaghetti will partially cook the egg, but still leave it moist and creamy). 4. 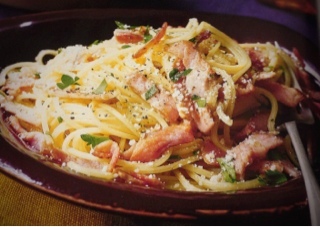 Divide the carbonara out, sprinkle with parsley and the remaining Parmesan and serve. This recipe serves 4 and is syn free if using the cheese as your healthy extra. I also put about 200g of thinly sliced mushrooms to mine to bump it up a bit, and it was just as gorgeous. Also an inspirational story today, my mother has been dieting as long as I have, but she sticks to the diet of calorie counting since it has been successful for her. She's just recently got to a nice weight she is okay with and decided to take a break a couple of weeks ago, in this time I have been cooking more meals for the household so my mum has hardly had any of her own meals. She informed this morning that without even trying she has lost 5 pounds, there is nothing different about her lifestyle except for the one fact that shes been dining on Slimming World low syn or syn free meals. If there is any need for proof that Slimming World works, this is definitely it! If my mother can lose 5 pounds with out even trying or knowing, I can definitely lose the 2 pounds I have put down for next week! Congrats to my mum!